The Tuesday evening friendly versus Forfar Athletic U20’s at Whitton Park has been cancelled. Please check back the website for further pre-season fixture information. 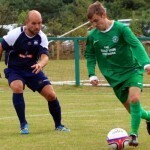 Broughty Athletic are back in pre-season friendly action again on Saturday when they make the journey North to face Premier League Side Montrose Roselea. Kick off at Broomfield Park, Montrose is at 2pm.